It has been far too long since my last, things have been a little crazy in the past few months with a new project in the works and a few new menus in the restaurant. I have finally found some time to do what I love, make pasta! I do not know why I like tortellini over ravioli but I suppose it’s the same reason why some people like fettuccine over linguine. Sweet corn season is right around the corner and I cannot wait, it is one of my favorite vegetables. 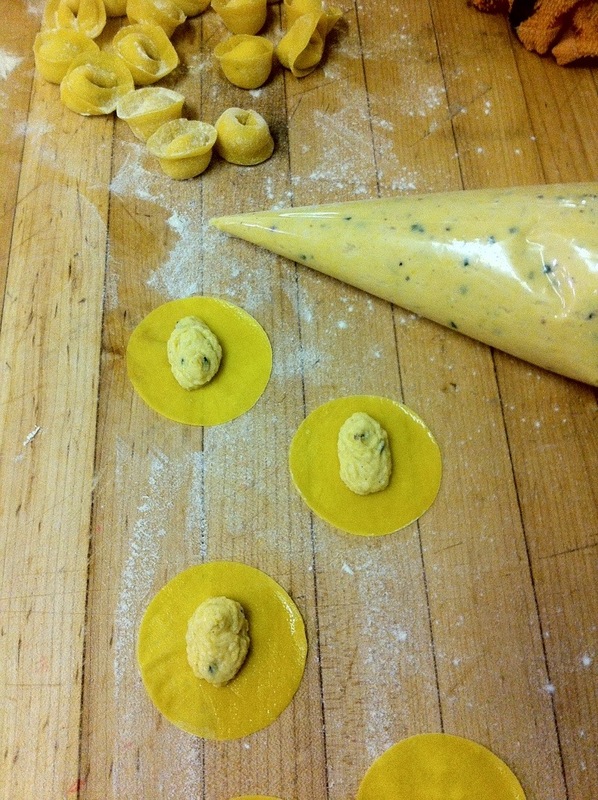 These little tortellini’s pack quite a punch with their Parmesan and herb enriched corn center. The filling is nice and smooth and just melts when you bite through the pasta. Once you remove the kernels from the cob of corn be sure to save the husk and the cob to make a corn stock. The husk has a much stronger corn flavor than the actual kernels so I usually add a half white onion to the stock and simmer for a couple of hours. Thin slice the white onion and saute in the butter until it is soft. Add the corn kernels and cook until soft. Combine the remaining ingredients and the sautéed corn in a vita-mix and puree until smooth. 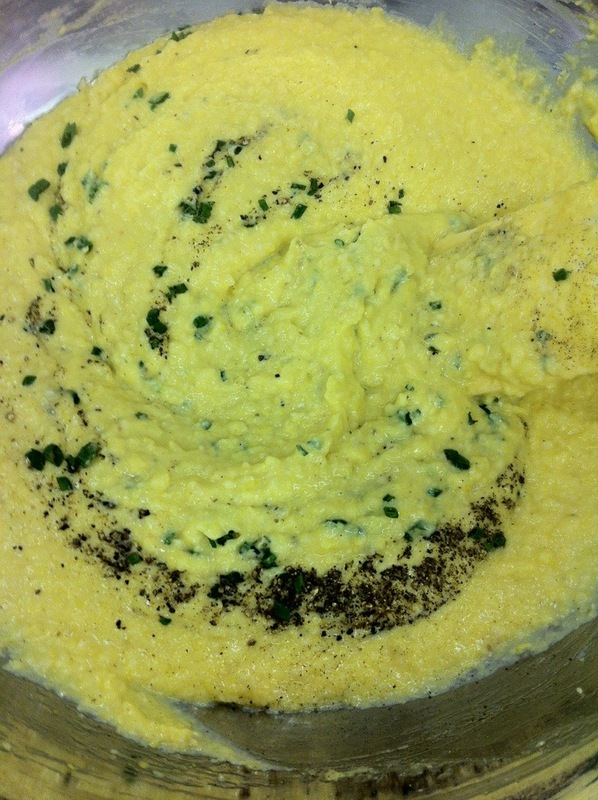 Place the corn puree in a bowl, add chives, and season, then place in the fridge until cooled. Tortellini’s are fun and very easy to make once you get the hang of it. Start by putting your corn filling in a piping bag or in a plastic bag to make it easier to pipe onto the pasta. 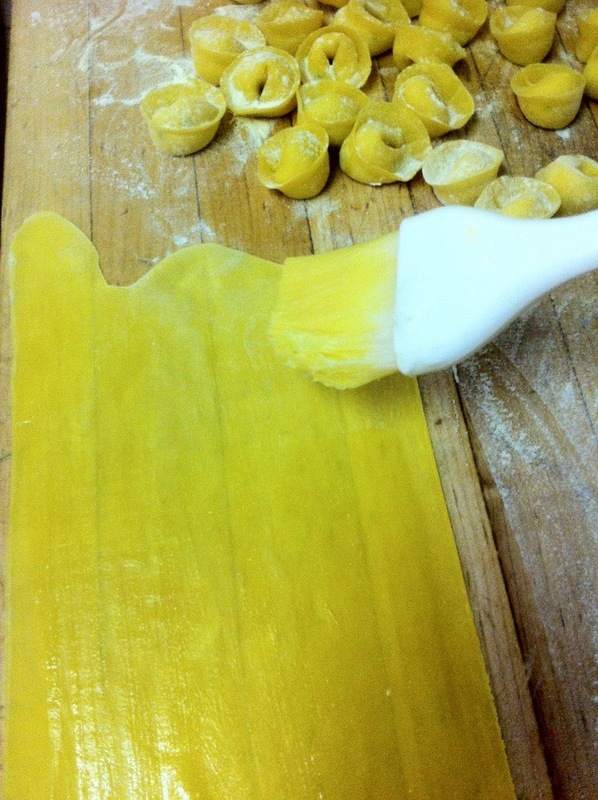 Brush the sheet of pasta with the egg wash. 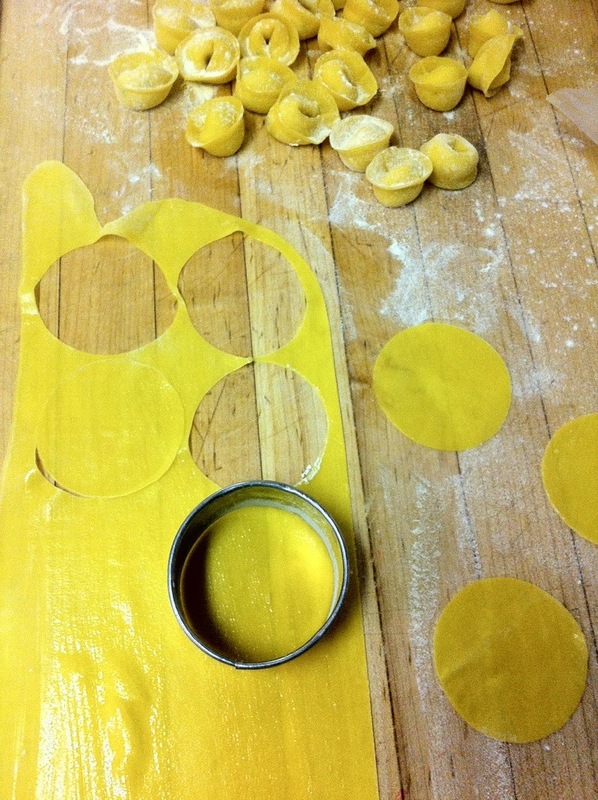 Using a circle cutter, cut out pasta circles, you will want to cut them bigger than you think, about 2.5″ to 3″. Pipe the corn filling onto the center of the pasta circles. Be sure to leave yourself some room around the edges to make folding and bending the pasta easier. Fold the pasta in half to create being careful to not let the filling seep out in the process. 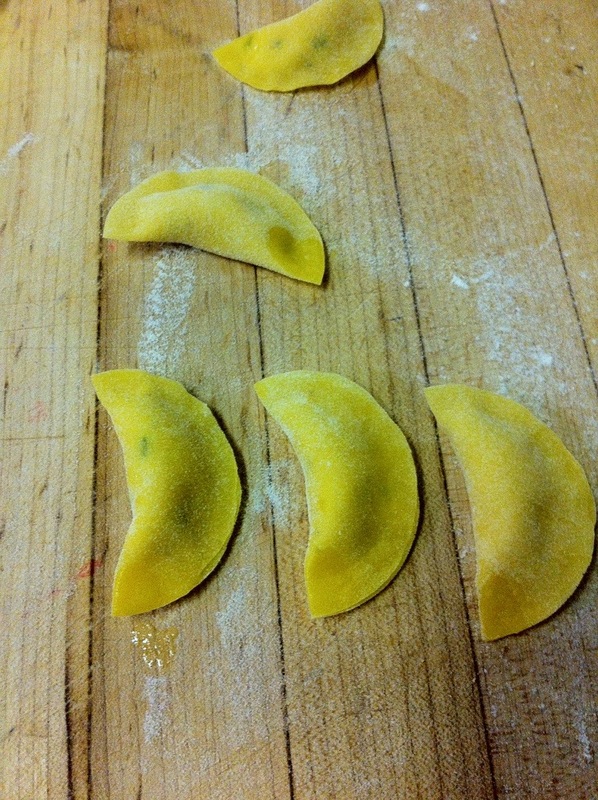 You will end up with a half-moon shaped filled pasta. Pinch the edges to ensure they have sealed properly then, using your finger, spread a little egg wash on the corner of the half circle. You will see this in the picture below. Here comes the hard part, place the pasta in your fingertips with the rounded part toward your palm and the center of the filling side against your ring finger. 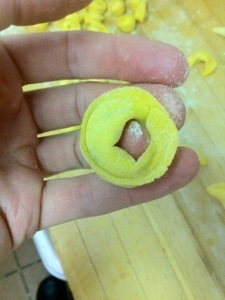 With the other hand wrap the pasta around your ring finger, connecting the two corners the were egg washed. The edges should turn upwards on their own but you can help them in order to get the desired shape. Pinch the two corners that just came together, and viola! you have corn filled tortellini. It is important that you go through this whole process fairly quickly to avoid drying out the pasta dough. If it dries, it will crack and tear when you try to wrap it around your finger. Once it has been formed you can let them sit and dry on their own to allow for easier handling. For assembly, bring a pot of water to a boil then reduce to a simmer. Cook the pasta until it begins to float and then remove from the water and let dry for a couple of minutes. In a saute pan melt a tablespoon of butter and saute the tortellini for a few seconds, de-glaze with white wine then add about one cup of corn stock. Simmer the tortellini until you have reduced the stock by 3/4 the amount. Season and serve. 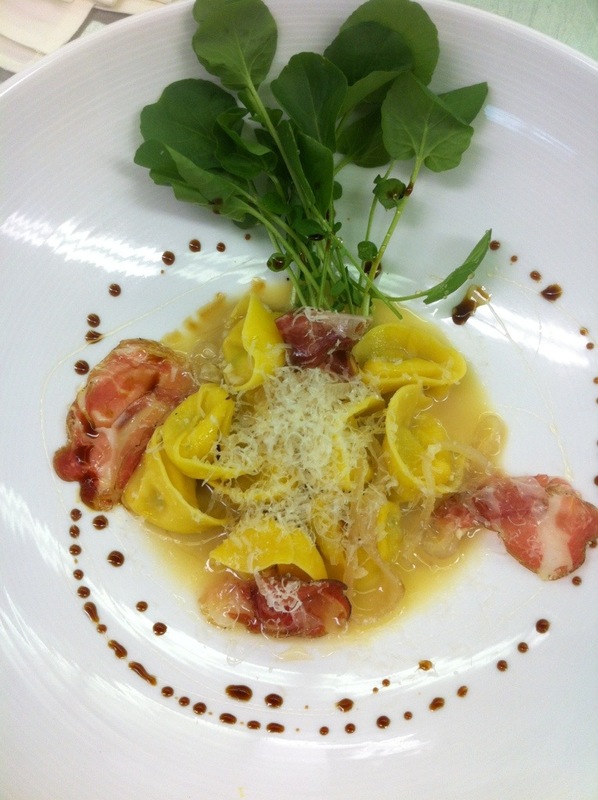 The tortellini goes great with spicy greens, such as arugula and watercress, and any kind of dried cured meat, I used coppa.